There is no better gift than the gift of education to open the minds of students to knowledge. Founded in August 1996, the H. S. Chau Foundation is spreading this gift across China to realize its mission: make education accessible to all. "There are many bright and inquisitive children who have the potential to become doctors, scientists, professors. If only they could afford tuition. Some have to give up the chance to learn before even finishing primary school - especially girls. Witnessing the stunted growth of these pillars of tomorrow's society is heart-breaking," wrote a teacher from China's poverty-stricken Dai Liang Shan. 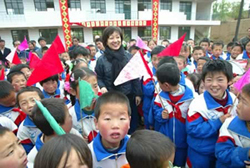 Ms Debbie Chang, director of the foundation, was attending the opening ceremony of one of the “tomorrow primary school ”. Ms Debbie Chang’s was visiting to the newly-built school. The Foundation promises a better tomorrow. It strives to support educational development in China's poor regions and to enhance educational opportunities for girls. Ms Debbie Chang and the students of the school. 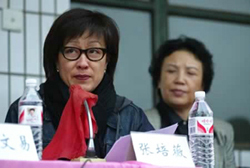 Ms Debbie Chang and the principal of the school. To this end, the Foundation launched Project Tomorrow, an integrated system supporting the multi-faceted elements of a good education: from primary schools to universities, from teachers to students, from cultural learning to technical training, from school supplies to tele-education infrastructure. Key initiatives so far include building a network of "Tomorrow Primary Schools" furnished with computer equipment, implementing training programs for the "Female Teachers of Tomorrow", and establishing education sponsorships for the "Girls of Tomorrow" and the "Female University Students of Tomorrow". We believe education is the key to the future - the future of girls, of boys, and of the country. Only through upholding education can each of us attain a more productive, more fulfilling life to the benefit of society. But it takes a collective effort. We ask those teachers and students who have received our support to pass the torch. Help multiply our efforts to illuminate the minds of tomorrow through sustained educational development.